Earth Emulsion has been tested for over two years on over 15,000 acres of field and row crops. Earth Emulsion is double screened through 200-micron filters, so it will not clog your current systems (drip irrigation emitters, pivot, tractor sprayers, aerial sprayers or backpack sprayers). Earth Emulsion is easy to clean up and leaves no messy residue like fish emulsion products. Derived from grain fermentation solubles, sulfate of potash and fermented molasses. What packaging sizes is Grower’s Secret Earth Emulsion sold in? 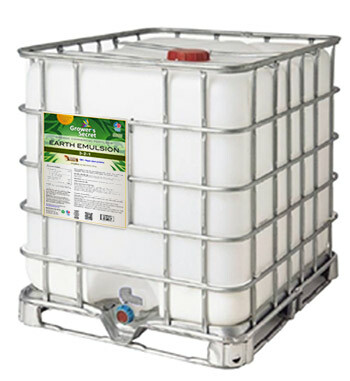 Grower's Secret Earth Emulsion is available in 55 gallon drums and 250 gallon totes. What is the proper use rate Grower’s Secret Earth Emulsion? Apply 1-3 gallons per application and continue applications as needed to actively growing plants as needed based on a leaf analysis. How is Grower's Secret Earth Emulsion applied? Mix well before product transfer, and after mixing with water for use. Applications can be made pre plant,at lay-by, foliar or through irrigation systems. Will Grower’s Secret Earth Emulsion damage or burn my crops? Grower's secret Earth Emulsion is effective and should be used only at the application levels recommended. Grower's Secret Earth Emulsion should only be used according to plant needs and suggested use rates. If you have not used a product before, we recommend that you conduct a small jar compatibility study before mixing products to be applied at the same time in the field and also conduct a small infield phytotoxicity test before you apply it in wide-scale use. Can Grower's Secret Earth Emulsion be used through a drip system? Grower's Secret Earth Emulsion is screened to 200 mesh and can be applied through a drip system at suggested use rates. Check system calibration and function to assure even distribution and proper application rates are being applied. What is the shelf life of Grower's Secret Earth Emulsion? About 1 year if stored properly. Do not store above 120F. Materials may need to be agitated every 4-6 weeks to maintain product continuity. I started using two Grower's Secret products on our commercial edible cactus plantation last spring. I was so stoked with the incredible results that I am going to replace our old animal-based fertilizer products exclusively with Grower's Secret products. EXPLOSIVE GROWTH! FAST GREENING! Also as a foliar there is less danger of filling the ground-water with nitrates. This is good stuff indeed. Growers claim Earth Emulsion works as well or better then fish; no clogging, vermin, or smell.